“A sign at Lassen Volcanic National Park,” from the photo stream of busybeingborn. It’s on Page 9 of “Rude World, 100 Rudest Place Names in the World,” which arrived in today’s mail (Thanks Rob and Ed). More of the book’s antics are at the Rude World site. 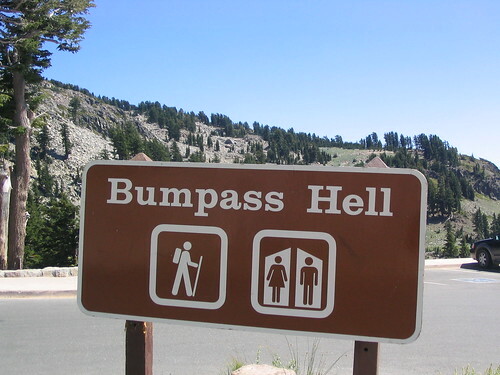 The site is Bumpass Hell, a somewhat famous geothermic feature at Lassen Volcanic National Park. Lots of folks go here but it seems to rarely have occurred to anybody to take a picture of the sign; I did, and the authors of this book sought out permission to republish it.